Okay, I’m a lazy cynical b*stard. When I became aware of the fight against Fracking in New York, I thought it would be a foregone conclusion that activists would lose. Noises to the contrary notwithstanding, when the big players started talking about fracking as the first part in a chain of fossil fuel initiatives that would end with an LNG export port sitting off Long Beach, I thought the bad guys would win. Too much big money was at stake to allow a few protests to change things. 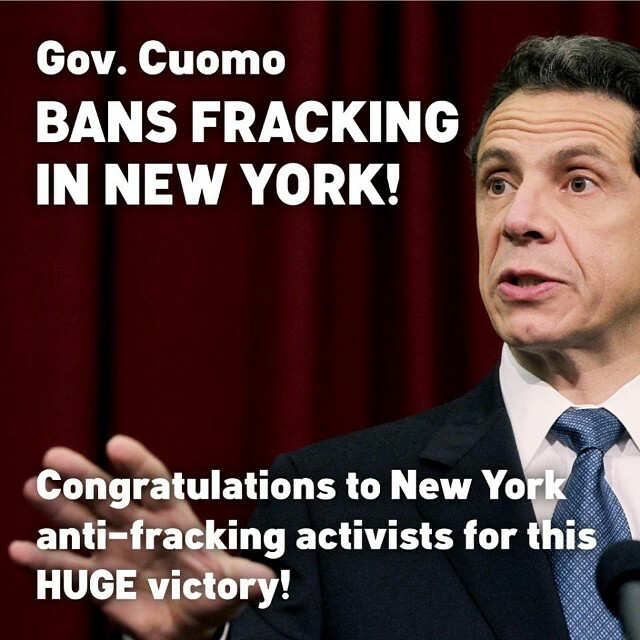 Today (December 17), New York Governor Andrew Cuomo made it clear that New York State would not allow fracking. There is shock and joy among my friends who’ve fought against fracking. The joy part is obvious. The shock is that Cuomo caved. He had been crafting a series of end-run ways to bring in fracking upstate. This was everything from pushing for test fracking sites to handing over the writing of his infamous ‘frackonomics’ report to a pro-fracking PR firm. New York was also the only one of the 50 states to lack adequate rules about the dumping of fracking waste on public roadways and right-of-ways. He had also ‘solved’ an impasse over casinos with the Oneida Indian nation by having their land revert to federal control–a back-door way of allowing fracking in their lands (federal law does not prohibit fracking). Getting Cuomo to do the right thing looked like a lost cause. And to be fair, his decision also hasn’t made him popular with the pro-fracking crowd. At least one blogger has gone so far as to state that Cuomo is on the Saudi’s payroll, since the Kingdom would benefit from fracking not going forward in the US. One can argue (as some have) that this decision was due to timing and economics far removed from Albany. Until the last few weeks, most financial analysts were bullish on the energy markets and the future of not only fracking, but also technologies such as tight oil, shale, and tar sands. That isn’t true anymore. Energy markets are currently in free-fall, with oil prices falling almost 50% in the past few months. As I’ve noted here before, there are some real limitations on unconventional oil and gas extraction. Both cost big in terms of capital investments. As Post-Carbon Fellow Richard Heinberg has pointed out, capital investments on unconventional fossil fuel plays see a huge drop-off in production after a year or so. It’s the classic Alice In Wonderland problem of running as hard as you can to stay in one place. And unconventional oil has a lousy return on energy investment. Such production costs multiple times as much as conventional drilling. The reality has begun to dawn on even the most enthusiastic proponents of these technologies that the US will never be energy independent with fossil fuels. One could also argue that the decision was driven by geo-political issues. The Russian Federation is taking a big hit from both embargoes brought over Ukraine and cheaper prices for its fossil fuel exports. This might not be the only wild card in play. The oil exporters in OPEC may have been strategizing to kill both unconventional oil and competition from renewables. You could argue all of that, and all of it probably had an impact. But the Empire hates to lose this kind of fight. The prime movers in this fight probably kept hoping the demonstrators would just go away. They counted on the strong possibility that the outrage would stop and the deals could be made behind closed doors. The Occupy Wall Street Movement and the anti-fracking activists kept the issue on the front burner. Sane Energy Project deserves a huge bow, as do the People’s Puppets of Occupy Wall Street. I had attended a couple of protests myself (I’ve conflated their protests against fracking with their protests against the Gansevoort Pipeline), though I drew the line at getting naked and being painted green. Because, well, you know. So… if you need to do something worthwhile for the world at the end of the year, you could send some money to the Puppet people. Those giant Monopoly men don’t make themselves, Y’Know. And Sane Energy could also use some support. And though the fracking fight in NY State appears to be over, a new Congress and Senate are coming into the Beltway come January, and the new Senate’s majority party wants to push through every fossil fuel initiative on the table. That includes more coal out of Kentucky (the home state of soon-to-be Senate Majority leader Mitch McConnell) and completion of the KXL pipeline. On the other hand, the current crash in oil prices may do a great deal to discourage big capital projects on fossil fuels. Thanks to the folks who were out on the streets. You changed the narrative and you won. That doesn’t happen very often.